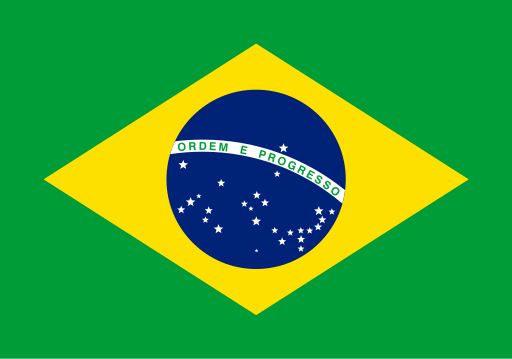 The Federative Republic of Brazil is the largest country in South America and the fifth largest nation in the world. It borders every South American country except Chile and Ecuador and has a 4,500 mile coastline along the Atlantic Ocean. The country has strong links with Portugal, having been colonised by Portuguese explorers in 1530. Their descendants ruled until 1889, when military leaders and landowners expelled the king, and Brazil became a federal republic. a yellow rhombus representing the gold and diamonds found in the country. The country’s capital city is Brasilia and its currency is the ‘real’, which is divided up into 100 ‘centavos’. Local time is between two and four hours behind GMT, depending on where you are in the country. Brazil’s population is approximately 201,032,714 people, with their main language being Portuguese. About half of the people are white, with the other half being classed as ‘pardo’ (shades of brown). The country’s national bird is the Rufous-bellied Thrush, famous for its sweet melody, and its national flower is the tecoma chrysostricha, famous for its bright yellow flowers. Brazil is the world's leading coffee producer and also has rich reserves of gold, diamonds, oil, and iron ore. Cattle ranching is an expanding industry. Typical foods eaten include: rice, beans and feijoada (a beef and pork stew). The most popular sports are football and volleyball. Most children go to pre-school up until the age of six, when they then start primary school. When they become teenagers, it is compulsory to learn two foreign languages, usually English and Spanish. Schools must be open for at least 200 days a year, in comparison to a 190 in the UK.